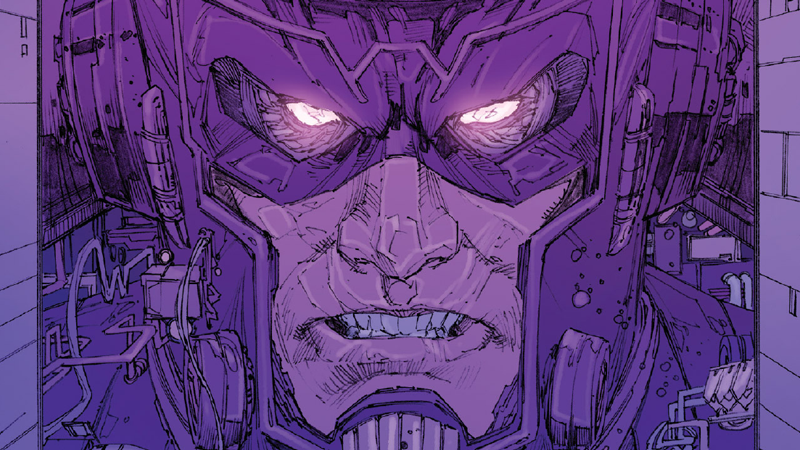 Galactus has long been one of Marvel’s grandest villains—an almost unstoppable force who threatens the universe time and time again no matter how many times he’s turned away. But one of Marvel’s myriad new Avengers teams may have done something that changes Galactus for good... or at least, for a while. Spoilers for Ultimates #2, by Al Ewing, Kenneth Rocafort, Dan Brown, and Joe Sabino. The pitch for the Ultimates—Black Panther, America Chavez, Blue Marvel, Monica Rambeau and Captain Marvel—is that they find solutions to the biggest cosmic threats facing the universe (hence the name). But how do you solve a problem like Galactus? Apparently it involves a great big box, and a lot of energy. Ultimates’ first two issues have seen the team attempt to negotiate with Galactus after a recent reawakening, in the hopes they can stop him from nibbling on planets. The Marvels Captain and Blue attempted to parlay with Galactus only to be captured, so the team falls back on Plan B. Black Panther translocates from Earth to Galactus’ base (and, told over a fantastic multi-page spread from Kenneth Rocafort, learns more about the origins of Galactus and how he was transformed from the sole survivor of a pre-big-bang civilization into a power-hungry god) to distract Galactus while Monica and America haul in backup: A big box. But not just any box—the incubator that birthed Galactus after his transformation during the birth of the solar system. The team (well, mainly Monica, using her power to transform into a massive surge of energy) blast Galactus back into the incubator and douse it with cosmic energy in the hopes that whatever process made Galactus the way he was can be reversed, or that it can get rid of him all together. ...from a new, shiny Galactus, who apparently restores life to worlds rather than having them for dinner after some alone time in his big space box. Has Galactus gone good? It’s not a major surprise, as ever since Ultimates was revealed, it teased that Galactus would be a big player in the book’s early stages, and maybe even aid the team. But Marvel might have just turned its biggest cosmic villain into one of its biggest comic avengers.